SOURSOP is a native of tropical America and commercially it quite important fruit crop there. 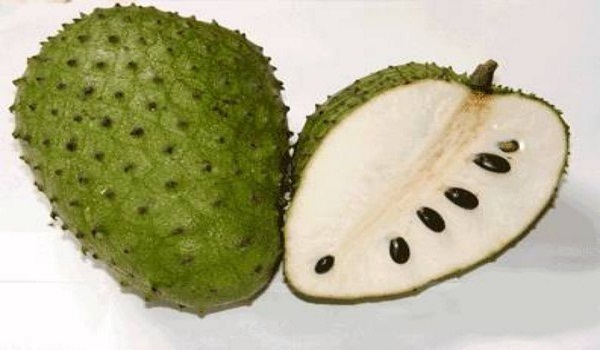 Soursop was one of the first fruits trees introduced by the Spanish sailors to the old world after Columbus discovered America. Now it has spread to almost every tropical parts of the world. A shrub or small tree, 3-10 m tall, conforming to troll’s architectural model, branched from near the base. Leaves oblong-obovate, 8-16 x 3-7 cm, short acuminate at apex; petiole 3-7mm long. Flowers regular, in short 1-2 flowered inflorescences, greenish-yellow; pedicel up to 2.5 cm long; sepals 3,triangular, persistent, about 4 mm long; petals 6, in 2 rows; 3 outer petals broadly ovate, 3-5cm x 2-4 cm; 3 inner petals 2-4 cm x 15- 3.5 cm, with short claws at base; stamens numerous, in many rows on a raised torus, 4-5 mm long, filaments densely pubescent; ovaries numerous, densely pubescent, afterwards confluent. Fruit a pseudo carp, broadly ovoid or ellipsoid, up to 10-20 cm x 15-35 c, dark green and covered with soft spines 6 mm long, with fleshy, juicy white pulp. Seeds numerous, obovoid, 2cm x 1 cm, blackish-brown shiny. Soursop is usually consumed fresh. It is also mixed with ice-cream or milk to make a delicious drink. It can be made into a fruit jelly, juice (with the addition of sugar), nectar or syrup. Sometimes, mature but firm fruit may be made into candies of delicate flavour and aroma. The fruits have 67.5% edible pulp, 20% peel, 8.5% seeds and 4% core by weight. Sugars constitute about 68% of the total solids. Soursop is a good source is a good source of vitamins B (0.07mg/100g pulp) and C (20mg/100g pulp) and a poor to fair source of calcium and phosphorus. The most desirable characteristic of the sour sop is its extremely pleasing fragrance and flavour. 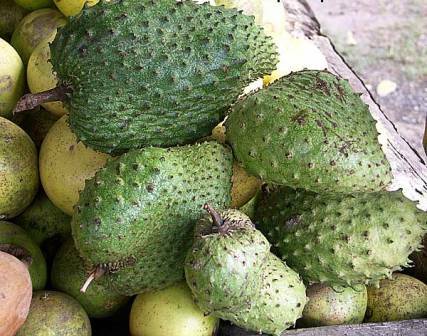 Soursop requires a warm and humid tropical climate. Growth and fruiting are hampered severely by cold spells and light frosts kill the tree. A dry season enhances leaf fall and synchronizes extension growth and flowering to some extent. Yields may be higher under these conditions, provided that high humidity prevails during the period of fruit set. This fruit can thrive in most soils, but drainage should be good because the tree quite sensitive to water logging. The perishable nature of the fruit is a serious handicap for large scale commercial production. 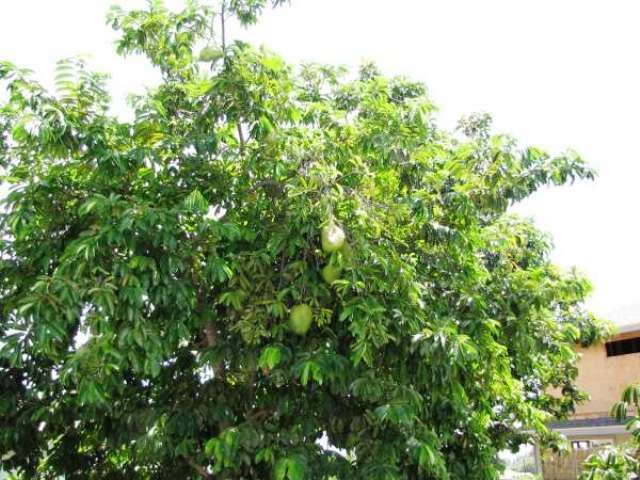 So the tree is commonly planted in home gardens and the fruits can be seen fruit in markets everywhere in tropical countries. Though asexual propagation in soursop is possible by budding as well as grafting, but still this fruit is mostly raised from seed. Buyers accept seedlings because populations are fairly uniform –seeds of the sweet type for instance, are generally true to type–and because the juvenile phase lasts only 2-4 years. Seeds may be sown directly in the field or in a nursery bed. The germination starts in 20-30days and the success is 80-90%. The seedlings are ready for planting after 6-8 months. A spacing of 3m x 4m to 4m x 6m is recommended for planting trees in orchards. Being a small and a precocious tree, this fruit may also be planted as an intercrop between larger fruit trees such as mango. When the main crop requires the space, the soursop trees uprooted. A special feature of soursop is that its flowers are protandrous i.e. the pollen is shed before the pistils are ready. Consequently, there can be reduced fruit setting and fewer yields at some times. The tree basins should be kept free weeds or covered with mulch to avoid dehydration of the shallow roots during the dry season. The soursop can tolerate dry soil conditions, but the trees shed too many leaves if they experience prolonged drought, and in that situation they would benefit from supplementary irrigation. Application of manure and /or NPK fertilizer in small does a few times each year promotes growth and fruiting, but no quantitative data on fertilizer requirements or recommended leaf nutrient levels are available. Trees usually assume a satisfactory form, but in some cases it is necessary to limit the tree to a single trunk by cutting out competing twigs as early as possible. Water sprouts, interlacing and crowded branches should also be removed. Inadequate pollination appears to be the main factor limiting yield and hand pollination is often recommended. However, it is rarely practiced and is feasible only where there is a definite flowering period. The sour sops fruit should be harvested when fully grown and still firm. They are considered mature when their spines are set far apart and the shiny green colour turns dull-green or yellowish-green. If picked prematurely, fruit quality remains poor. On the other hand, fruit left to ripen on the tree are often attacked by bats if they do not first fall to the ground. In a non-seasonal climate, fruit may ripen throughout the year, but usually there are 1-3 harvest periods, with a prominent peak in the course of the main season. The fruits have to be picked selectively. They are cut from the peduncles using a sharp knife or pruning shears and placed in bamboo baskets lined with soft material such as straw. Yields are generally low; one or two dozen fruit per tree year, each fruit weighing more than 1 kg on average. More precise figures for a 35-year-old plot in Hawaii show that yields can be much higher; the mean fruit numbers per tree were 33, 34 and 70 in the 4th, 5th and 6th year after planting at the rather low density of 215 trees/ha these yields were equivalent to 9.2, 7.6 and 18 t/ha. As long as tree vigour is maintained, serious damage by diseases and pests is largely limited to the fruit. Anthracnose (Colletotrichum gloeosporioides) is the principal disease of sour sop in a humid environment. 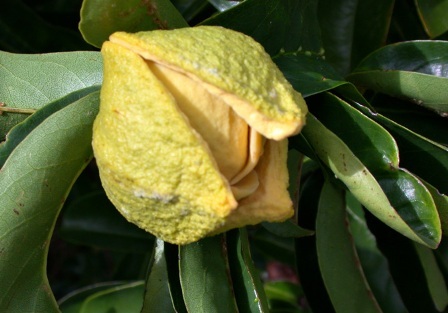 Fruit production may be severely limited by infection of flowers and fruit, which rot or shrivel; moreover, the disease affects maturing fruit and leaves and stems as well. It has been suggested in the West Indies that selection for the ability to set fruit under humid conditions is worthwhile. Where there is a dry season it is perhaps possible to advance flowering ad fruit set by irrigation, in order to escape the period of highest of humidity. Brown stem rot (Corticum sp.) infects and causes the decay of branches ad may kill the tree. A through cleanup at the end of the dry season, including burning of the infected material, should help to contain the disease during the wet season. Scale insects often infest the trees and mealy bugs may occur in masses on the fruit. If ants are adequately controlled, natural enemies should be able to cope with these pests. Fruit can be bagged to avoid damage from fruit flies. Annonaepestis bengalella is a fruit borer; the moth occurs from India to Java and the Philippines. The large caterpillars of Meganotron rufescens and those of Papilio Agamemnon are often found eating the leaves. The damage caused by these last 3 pests generally does not warrant chemical control. Ideally, without to be processed should be stored in single layers so that each day the ripe fruit can easily be selected for processing. These fruits are washed in chlorinated water in chlorinated water to remove dirt and reduce the microbial load. The washed fruit is peeled and cored by hand to retain the pulp for further processing.